Whilst things seem to have been all Santa Clara lately in terms of Guatemalan coffees, this offering from the Don Antonio farm in the Huehuetenango region has certainly been no less enjoyable in the cup. There have been some fine central American varieties on offer at Ministry Grounds in recent times. The latest newsletter being no exception, containing no less than fifteen coffees, largely from El Salvador, Guatemala and Panama, with a few Cup of Excellence varieties to boot. Choosing which one or two (or few) to buy will be the next challenge. 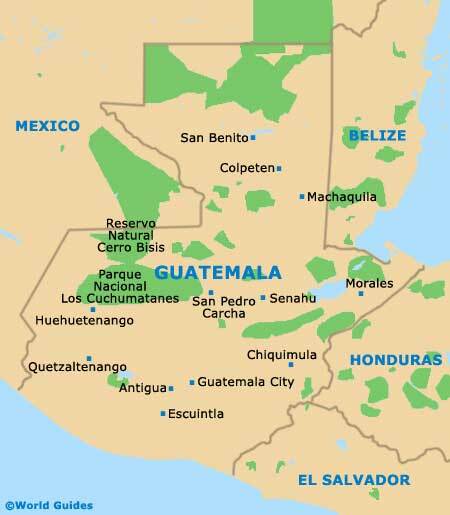 The Huehuetenango municipality lies in the highlands west of Guatemala City, towards the Mexican border (map below courtesy Worldlink). Huehuetenango (originally called Xinabahul in the Mam language) was originally a Mayan settlement. Many people of Mam descent still live in and around Huehuetenango, and the nearby ruins of Zaculeu have become a tourist attraction. These ruins are markedly distinct from other Mayan archeological sites; the original unearthed stones, comprising only a small portion of the original structures, were coated with plaster during restoration works carried out in the 1940s. There is also a small museum at Zaculeu which includes statues and small artifacts found on the site. The Sanchez family commenced their coffee business in 1966, with current owner Antonio (Don Antonio) taking over from his father and continuing to run the farm, located in the district of San Pedro Carcha, Huehuetenango. I had originally planned on roasting this a little darker for use in the espresso machine, however the planned filter roast that day (an Ehtiopian Yirgacheffe) got away from me a little and inherited the espresso roast somewhat by default. Therefore, to avoid filter withdrawal, a lighter roast for the Don Antonio it was. I cannot say I am overly sorry, as the Yirgacheffe has made a great morning latte (good body, hint of chocolate with a nice berry finish) this past week. As for the Guatemalan? More below. There are times when I feel like a good, full-bodied brew. Sure, the Don Antonio is certainly not as bright nor clean as the Santa Clara was, and perhaps suits a diner mug more than a stylish glass, though for me, there is certainly nothing wrong with that. Overall, through the aeropress or the V60, this is a very well-balanced, enjoyable cup of coffee. As I have noted in the past, the Aeropress probably blunts some of those subtle flavours a little, however this coffee was a welcome daily addition to kick off the 4pm hour of power at the office through to knock-off time. Probably the impression I have given above is that this Guatemalan Don Antonio coffee is a less than subtle variety perhaps better suited to a filer pot. That could not be further from the truth. The fact is, each and every cup brewed (with a few left to go), has been thoroughly enjoyable, and if I were given this as the only coffee I could drink for a year, I would not be disappointed, perhaps just a little uninspired – eventually.